Although the statistics cover ‘struck by dog’ incidents as well as ‘bite by dog’ incidents, it is fair to assume that most incidents recorded are what we might loosely refer to as a dog attack. The fact is: 29 people were hospitalised in Northampton area in 2007-2008. Northampton isn’t on it’s own – dog attack hospital admissions have increased 43% nationally since 2001. Just over a quarter of all incidents involve children under ten. These are hospital admissions, remember – Not just minor injuries. It’s a significant and worrying trend – but yet it’s entirely unnecessary. 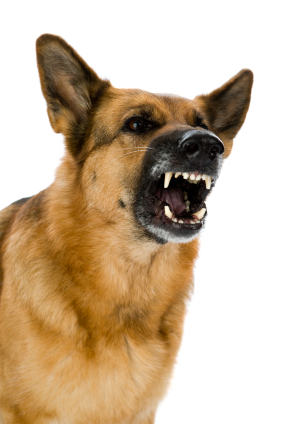 Dog attacks are avoidable in almost every case. Why do dogs attack? Is there such a thing as a bad dog or are owners always to blame? Is an aggressive dog this way from birth or is it down to the way it was brought up? It’s a question that has interested psychologists for decades – The so-called “nature or nurture” argument. The problem with the ‘nature or nurture’ argument is that it’s presented as a choice between one or the other whereas research now shows beyond doubt that behaviour – human too – comes from of a bit of both. On the one hand there are genetic traits (nature) and on the other, learnt reactions (nurture). All dogs – and all owners – are a product of breeding and upbringing. The problem for anyone seeking to change unwanted behaviour, of course, is that we can’t yet change genetics – only learnt responses. So what about “deed or breed” – Are some so-called dangerous breeds bound to be aggressive dogs because of genetics? Is it wise that certain breeds of dog are banned in the UK under the Dangerous Dogs Act? Or would we be better served by laws which require owners to behave in a more responsible manner, regardless of the breed they favour? I’m often asked in radio and press interviews if I think that some breeds are dangerous. Personally I have two Rottweilers, a breed that has had more than it’s fair share of bad press. The fact is that an attack by a powerful breed of dog will be more likely to put you in hospital. That’s not rocket science, of course. But it’s just wrong in my opinion to ban certain breeds on this basis. If you have a Ferrari are you a dangerous driver because it’s a fast and powerful car? Is the local boy racer with his tricked up Ford Fiesta a better bet then..? I doubt it! It’s about responsibility – whether we’re talking about driving or dog ownership. Unfortunately in our society we seem not to favour responsibility any more – we legislate for everything except personal responsibility. You can’t have a well balanced calm submissive Pit Bull Terrier, but you can have an unleashed attack-trained dog that’s a real danger to the public and you will almost certainly not be prosecuted until after someone has been hurt. No one has to train a dog to be well behaved and anyone can own a dog regardless of how much they understand their needs. That can’t be right! Concentrate on good dog behaviour, whatever the breed of your dog, and you’ll be fine. P.S. If you’re worried about your dog’s behaviour, I can help. You can contact me here.